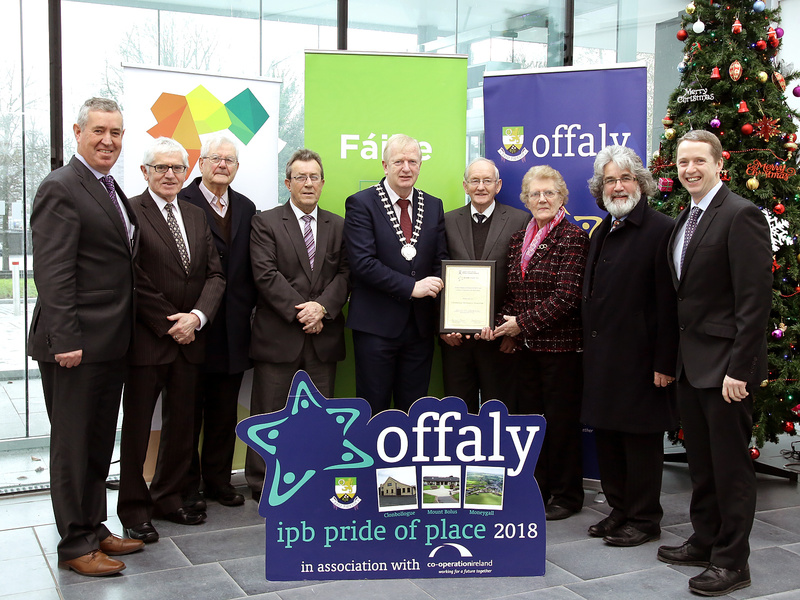 At the Monthly County Council meeting on Monday last, the three Offaly County Council nominated Pride of Place Community Groups gathered to be presented with Certificates of Recognition and Appreciation by Offaly County Council. Clonbullogue Development Association represented the Edenderry Municipal District area in the Population: 300-1,000 category, Acquired Brain Injury Ireland Mountbolus represented the Tullamore Municipal District area in the Community Wellbeing Initiative category, Moneygall Development Association represented the Birr Municipal District area in the Community Tourism Initiative category. Dermot Egan from Offaly County Council's Community & Culture Section read a citation for each nominee and then called the groups forward for the presentation by the first citizen of Offaly County Council, Cllr Danny Owens. As part of the address some background information on the groups was read out. Cathaoirleach Danny Owens presenting the certificate to members of the Clonbullogue Development Association. Also in the picture are Cllrs Noel Bourke and John Foley with Martin Daly Community & Culture Section and Dermot Egan, Community & Culture Section. Clonbullogue Development Association was nominated from the Edenderry Municipal District area. CDA was formed in 1972 and over the years has worked with the community, the Local Authority, Offaly Local Development Company, the employment services, and the Primary School. Built around a triangular green, this small community has much to be proud of, not least the successes in the National Tidy Town’s Competition which has brought numerous awards most notable being Tidy Village including best village award on two occasions, population, category and over thirty County awards. Clonbullogue Development Association engages in all areas of development and community activity ranging from the preschool to the active retired and everything in between. Acquired Brain Injury Ireland (ABII) Mountbolus was nominated from the Tullamore Municipal District area and acquitted themselves with some distinction on judging day. ABII is Ireland’s leading provider of community rehabilitation for those of working age (18-65 years) living with and recovering from an acquired brain injury from causes including stroke, road collisions, falls and assaults. A brain injury can affect a person’s ability to manage their own life and ABII deliver services in communities across Ireland to support and empower people to rebuild their lives. Regionally, Acquired Brain Injury Ireland are piloting a number of paediatric support services in the midlands. It is a national not-for-profit organisation which also campaigns, educates and advocates for the rights and needs of this hidden group in society. At any one time, they deliver dedicated individual neuro-rehabilitation to an estimated 1,100 people nationally and 162 regionally through residential, community and day services. Cathaoirleach Danny Owens presenting the certificate to members of Moneygall Development Association. 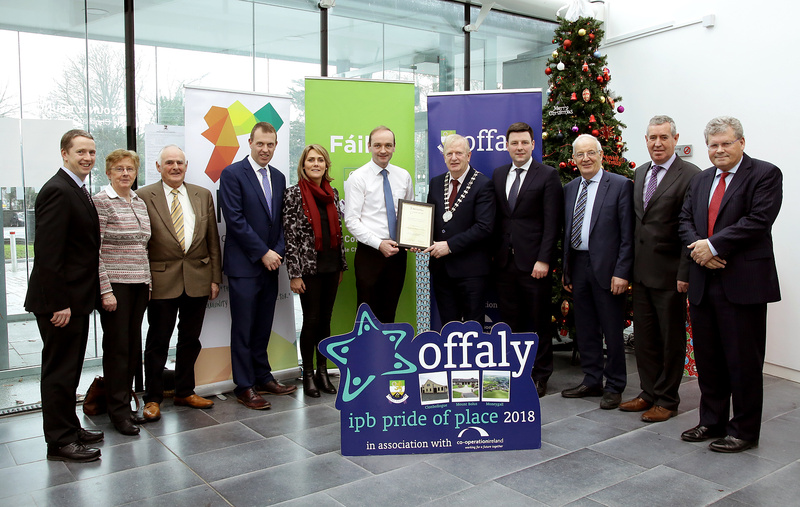 Also in the picture are Cllrs Peter Ormond, John Clendennen and John Carroll, with Martin Daly Community & Culture Section, Dermot Egan, Community & Culture Section and Frank Heslin, Director of Services, Offaly County Council. Representing the Birr Municipal District under the Community Tourism Category was Moneygall Development Association. MDA is a voluntary community organisation that was established in 2011 following the visit of President Obama. The primary focus of the association is to improve community living through the enhancement of local facilities and the encouragement of Community participation. Moneygall Development Association comprises local residents, public representative, business representatives and clergy, They all have an interest in developing a strong vibrant village in Moneygall which offers a pleasant and attractive place to live, work which is a destination for tourists, both local and overseas.